Military briefing by North Korean soldier at the DMZ. This is a guest post by Michael Milne. Times have changed and that title could more properly be claimed by other places, Baghdad or Kabul come to mind. 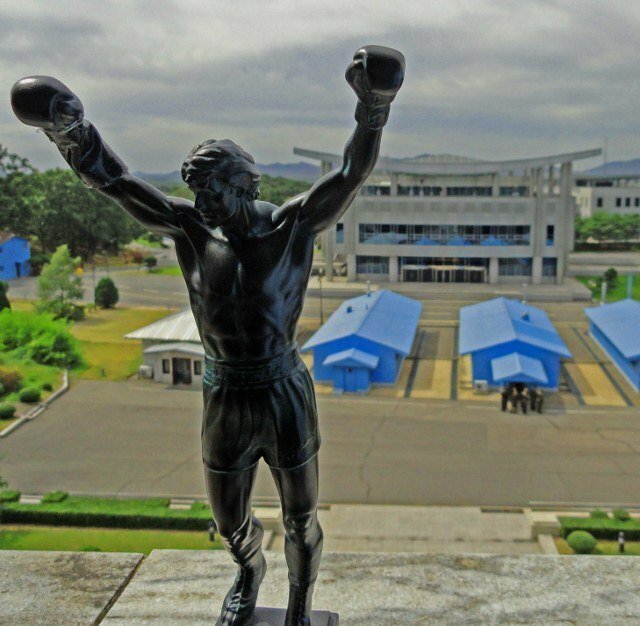 But the DMZ would still make anyone’s top five; on either side of the border sits the largest concentration of soldiers and weapons on the planet. We left our Pyongyang hotel early for the 120 kilometer drive to the DMZ. As we neared the border the bus passed through a series of checkpoints that were a few miles apart. These weren’t that intimidating, just a guard shack by the side of the road with a swinging gate out front. But as we approached each checkpoint the mood on the bus got a bit tense. 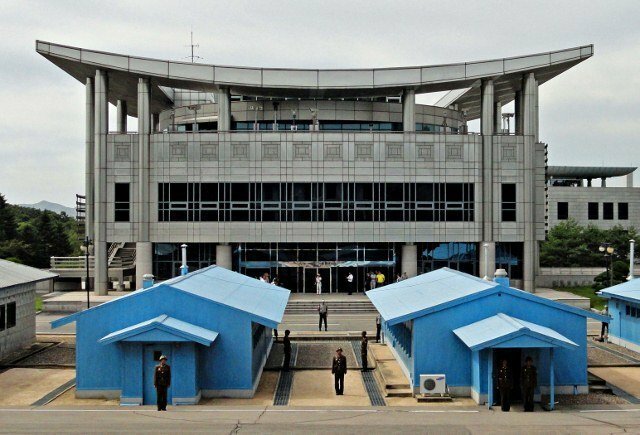 It was one thing to be in North Korea, it was quite another to be scrutinized by army personnel, particularly when carrying an American passport. After the final checkpoint, the bus pulled up to a large concrete wall where we disembarked. We were led into a building that contained a gift shop, at the DMZ of all places, offering a wide range of ginseng products and books by the Great Leader, Kim Il Sung. We soon learned that ginseng was available for purchase wherever we stopped in the DPRK. We were led into a room that contained a ten-foot high overview map of the area. 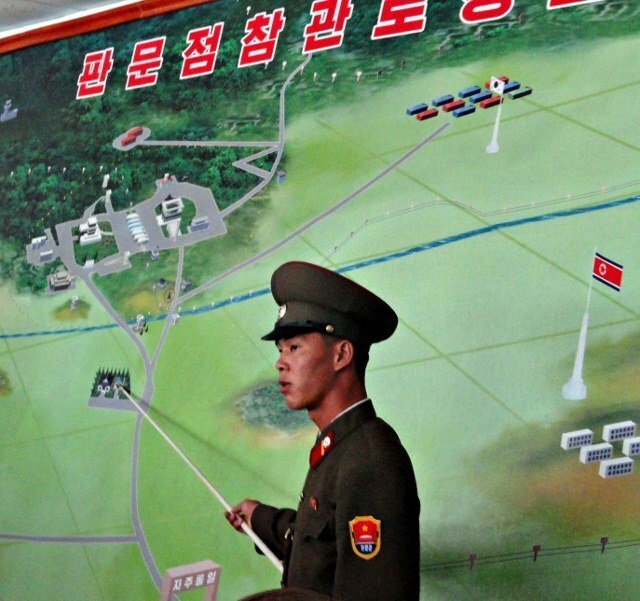 A North Korean soldier, wooden pointer in hand, proceeded to provide a military briefing on the DMZ. 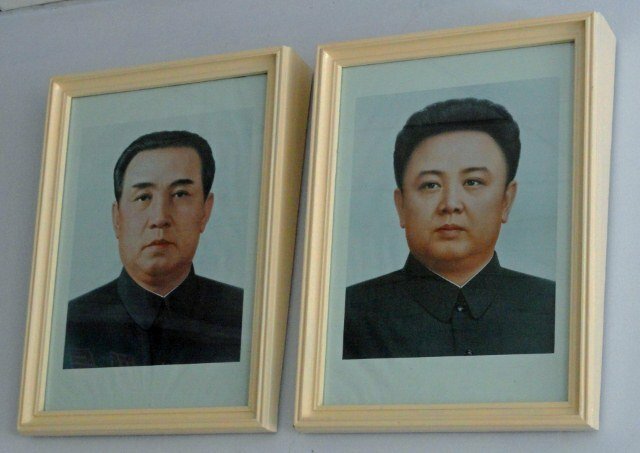 Like all rooms in North Korea, it had pictures of the Great Leader, Kim Il Sung, and the Dear Leader, Kim Jong Il, beaming down on the proceedings. After the brief pep talk we proceeded to the actual border which was delineated by a concrete curb that even a child could just step over. A series of small buildings the size of mobile homes straddles the border. We noticed that there was also a tour group lined up on the South Korean side. So while the North and South Korean soldiers stared off against each other to see who would blink first, we had our own stare down with the tourists, likely from the same countries as us, on the other side. We were permitted to enter one of the small buildings that straddle the border which is used as a conference room when there are disputes between the two Koreas. Through the small windows of the building we could see the South Korean guards about twenty feet away standing in battle ready positions, their arms hanging tensely at their sides with their fists cocked. As we ambled around the room, we walked in and out of both Koreas, so technically we were in South Korea at one point. On the bus ride back that was a matter of some discussion among our group as to whether we get credit for going to South Korea based on our brief foray. After we arrived back in Pyongyang, there was a sense of relief that we had survived our visit to the most dangerous place on Earth. Then reality set in, and we realized we were still in Pyongyang, the capital city of the most isolated nation in the world. With the recent death of Kim Jong Il, travel arrangements to North Korea are uncertain. The isolated country does not allow independent travel, and all groups are escorted by two minders. But if you are interested in visiting a fascinating country that is like no place else you've ever been, we highly recommend going there. The best place to start is with Koryo Tours. The British-run company has been leading tours to North Korea since 1993. About the Author: Larissa and Michael Milne are traveling around the world for a year with a miniature Rocky statue. You can follow their journey at http://www.changesinlongitude.com/ and on Facebook. They are also writing about their adventures for the Philadelphia Inquirer. Sounds like it needs to be added to your list! There have been a few incidents over the years but nothing that started another war. It was colo being in both Koreas in one building. Do I get to add South Korea to the list of countries I’ve visited? I never expected that North Korea is open for travel. I thought you had to do something special with the U.S. government’s aid to get here. Kudos to you Micheal! It’s great to know I can try there later.